Special correspondent from New York, July 15 (Just News) : In absence of Rule of law and Democracy, the freedom of press in a haphazard condition in Bangladesh. Murder, disappearances and extra-judicial killings are happening for political conflict. Freedoms of press are in obstruction in such situation. Journalists are oppressed in the country. 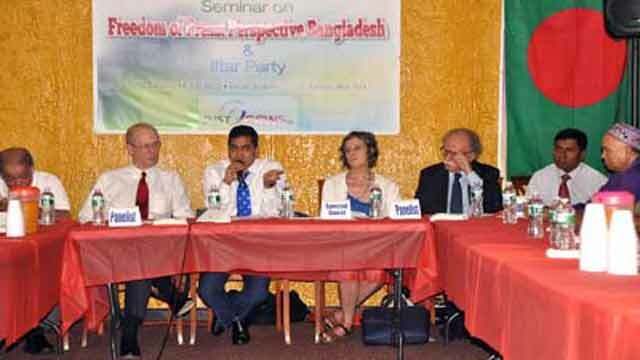 Speakers made this comment in a seminar titled ‘Freedom of Press: Perspective Bangladesh’ in New York last Thursday. Organized by online news portal Just News this was the ever first such kind of seminar in which journalist from home and abroad took part in the Jalalabad office in queens. Representative from the Foreign Press Center of the US State Department, UN Correspondent, representatives of local and international journalist associations were also took part among others. Conducted by Just News Editor M Mushfiqul Fazal as Moderator, United Nations Correspondent Association (UNCA) President Giampaolo Pioli and Director of the Foreign Press Center of the State Department Dale Prince were present as special guest in the seminar. New York Times former senior journalist Dulcie Leimbach, New York Bangla Press Club president Abu Taher, America-Bangladesh Press Club president Najmul Ahasan, Deputy Editor of the Daily Manabzamin Monir Haider and Weekly Holiday’S senior journalist Moinuddin Naser took part the discussion as panel speaker. Journalist and Human Rights activist Imran Ansary presented the keynote speech in the seminar. The State Department’s NY Foreign Press Center Director Dale Prince, referred to freedom of the press in the Obama administration, raising the idea of principles, saying that, like other countries around the world, the State Department is conscious of the Bangladesh issue. An annual report is conducted; the continuation of this resulted in the inclusion of Bangladesh’s democracy, human rights, and freedom of the press as high priority topics in the State Department’s 2014 report. UNCA President Giampaolo Pioli said that freedom of the press, even if desired, is very difficult to obtain; this freedom is being jeopardized. Citing his own 40 years of experience, he said, that not only in Bangladesh, many countries of the world try to controlled the media to strengthen and affirm the state powers, which is unfortunate. As a foreign journalist in the seminar, New York Times former senior journalist Dulcie Leimbach said, Journalists of Bangladesh are commendable for their professional duties through difficulties. Dulcie Leimbach said, journalism is a challenging job. Countries like Bangladesh its more challengeable. I realized that in the light of experience. Emphasizing on freedom of press she said, Society will be in the dark without the freedom of press. I hope Bangladesh will be successful to overcome this darkness. Senior journalist Moinuddin Naser said that the governments past repressive state had crossed all limits. The media is the victim of the government’s attacks. If criticisms are made against the prime minister, responsibility should be taken. Oppression of the govt already exceeded the previous record. The media is already attacked. If anyone criticizes the PM, have to face jail. New York Bangla Press Club president Abu Taher said, Its true that lots of media in Bangladesh now publishing and covering their news. But we need to think that who are the controller of this media? The current government has closed some opposition TV channels and newspapers after taking its power. Govt closed Daily Amar Desh and sends its editor into the jail, also closed Channel 1, Diganta TV, Islamic TV in which the owner are opposite minded of the govt. If it continues the future of the country will be plunged into darkness. As a panel speaker Najmul Ahasan said, Journalism in Bangladesh is now politicized. This was rare in 15 to 20 years ago. Its really a matter of sorrow. He marked the dividedness for the gaps. He cited the fragmenting of the journalists as the cause. Criticizing the judicial system, he said that Bangladesh’s judicial system has relinquished the vision of ensuring freedom of the press. Government’s control over media, ICT Act, Sagar-Runi murder, oppression of journalists also have given the priority in seminars discussion. Speakers demanded the immediate release of detained journalists and opens of the all closed media. Weekly Probas chief editor Oliul Alam and DRU former general secretary Monowarul Islam and Senior journalist Jainal Abedin took part in the open discussion at the seminar. Among others, Daily Naya Diganta special correspondent Shawkat Osman Rochi, Weekly Bengali Times editor Taser Mahmud, Somy TV US bureau chief Shihab Uddin Kislu, New York- Bangldesh Press Club General Secretary Salahuddin Ahmed, Weekly Runner editor Kawsar Momin, Time TV News Chief Abdur Rahim, victim journalist Shibly Chowdhury Kayes, News consultant Pulok Mahmud, Daily Ittefaq special correspondent Shahidul Islam, Riju Ahmed of ATN Bangla, Sajjad of Design Media, Salah Uddin Rasel of Weekly Porichay and other journalists were also present at the seminar. Set up an independent commission headed by International rights groups to investigate into the cases of persecution on journalists in Bangladesh. We request the CPJ, Freedom of the House and Reporters without Borders to lead international campaign to protect the free speech in Bangladesh. We request all countries that have diplomatic ties with Bangladesh to bring the issues of free press in every dialogue and meeting as an important agenda UN to formulate policies to ensure protection of journalists and media institutions. This will ensure that the issue continues to be given its due attention. We request the UN to formulate policies to ensure protection of Journalists and Media institutions. Al members of the UN Security Council create pressure to maintain a free press, especially create pressure to reopen shutdown all Media. We demand for immediate release of all journalists who are in prison now including ETV Chairman Abdus Salam, The Daily Amardesh acting editor Mahmudur Rahman, and the Daily Inkilab news editor Rabiullah Robi. A fare and acceptable investigation has to ensure murder of fellow journalist Sagor Sarwar and Mehrun Runi. Ensure life security of the Bloggers and writers.